Have you ever been to heaven? I stopped doubting it exists when I woke up there. Imagine you open your eyes to look around and find yourself in a tiny room, noticing a small window in the wooden wall. Seeking an answer to the dramatic silence you approach the windowpane, and voilà, only to see nothing at all! You rush outside to be swallowed up by the whiteness that surrounds you and feel goose bumps climbing up your body. Mornings in August can be freezing but the cold is not the only thing to blame for your body’s instinctive reaction. The fog begins to fade as the sun rays sneak out from behind the clouds and you stand stunned observing the mysterious Georgian mountains unfold in front of you. Welcome to Dartlo, heaven on earth, where people greet you with smiles and invite you to sing and dance under the starry skies. Where you can play hide-and-seek in the historic fortified towers still dwelled by locals. Where horses, rabbits and sheep won’t run away from you as you approach them. Where trees grow on rocky crevices and eagles dance in the mountains’ crisp air. Where the legends of delicious Georgian cheese, beer and vegetables are proven by your senses to be truthful. Yes, it feels and looks like a fairy-tale (be aware of the shepherd dogs though!). Dartlo, situated 2000 meters above sea level by the Alazani River on the northern slopes of the Greater Caucasus Mountains, is just one of the several heritage marvels in the Tusheti region of Georgia. 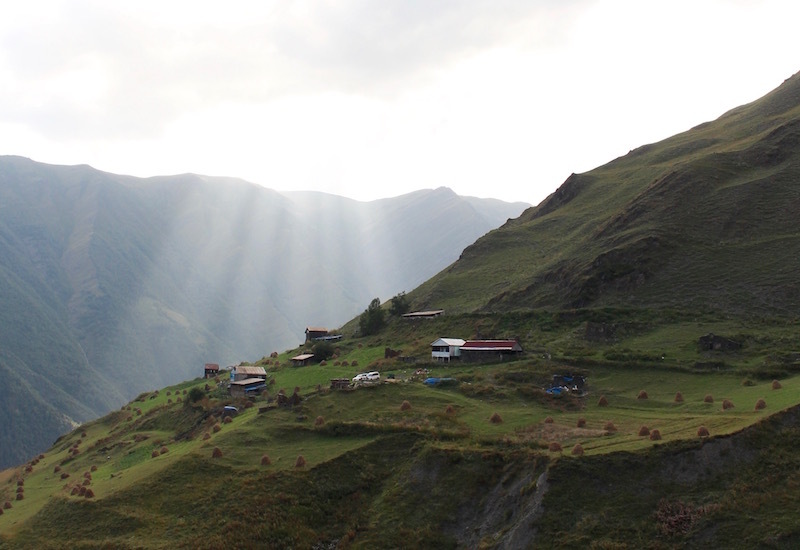 Tusheti is “where the interaction of people and nature over time has produced an area of distinct character with significant ecological, biological, cultural and scenic value” (IUCN). The protected area is perfectly suitable for hiking, trekking, kayaking, bird watching, and many other adventure tourism activities. 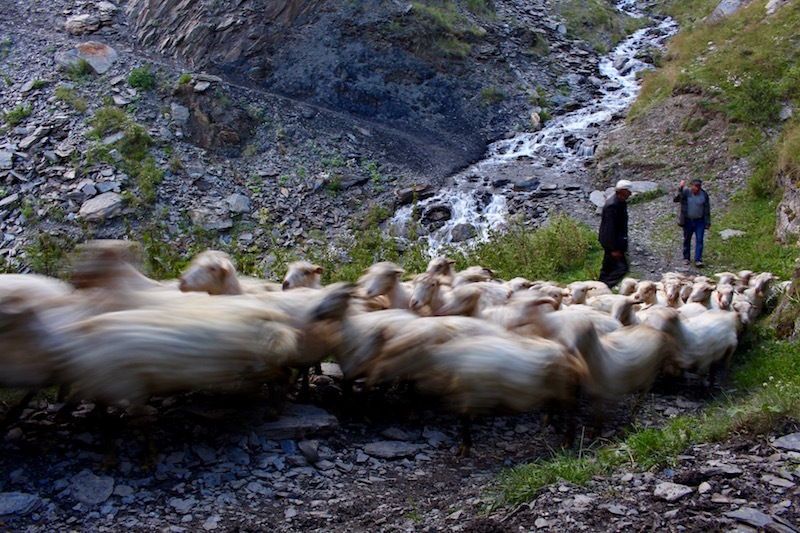 According to the Caucasus Nature Fund, Tusheti is home to the endangered East Caucasian Tur, Chamois and Bezoar Goat. Other animals include Roe Deer, Wild Boar, Brown Bear, Red Fox and the wolf. 120 species of birds inhabit Tusheti including the endangered Caucasian Snowcock and Caucasian Black Grouse. 230 endemic species of plants are found in the region; the Red Birch, Caucasian Fritillaries and Caucasian Rhododendron among them. Such a diverse and unique biodiversity alongside the local community’s overwhelming warmth and hospitality make this place unmissable to explore. Tusheti National Park is being marked this summer by a team of international volunteers as part of the creation of the ambitious Transcaucasian Trail. An important thing to note is that the tourism season in the high mountainous villages of Tusheti is rather short, from early June to mid-October, and weather dependent. So it’s high time you start packing for a hiking trip that you thought you would only discover in your dreams!